Dymatize Liquid L-Carnitine gives you an amazing 31 servings per bottle while delivering 1,100 mg of L-Carnitine in each serving. Liquid L-Carnitine 1100 in our generous 31serving bottle is the most convenient and flavorful way to get your pure L-Carnitine. Whether you use it for the health of your heart, endurance, or fat loss, you can be sure you are getting quality and value with L-Carnitine from Dymatize! Other ingredients:Purified water, natural fructose, l-carnitine, citric acid, natural and artificial flavors, potassium sorabate as a preservative, d-calcium pantothenate. 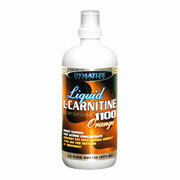 Liquid L-Carnitine 1100 mg Orange - is shipped in a discrete, unmarked package. Orders are processed immediately and usually take about 3 to 5 working days to be received. We do ask that you try it for 2 to 3 weeks to feel the full effects. Any information received is used only for order processing and shipping purposes. Your information, such as e-mail address, will never be disclosed to a third party.